Luke destroys Tagge's base on Yavin, ending the siege. Luke and Leia, stranded aboard their disabled ship, are rescued by a flight of Rebel X-wings. After sharing their intel about Baron Tagge and the means his ships are using to fly through Yavin with General Dodonna, the Rebels realize that the TIE fighters must be using some kind of device to find the Imperial station on the planet. Reasoning that the TIE which crashed on one of the other moons likely had such a device, Luke flies off with Artoo in a Y-wing to retrieve it from the wreckage. He lands near the crash, but the TIE pilot survived, and manages to blast Artoo before Luke takes him out. 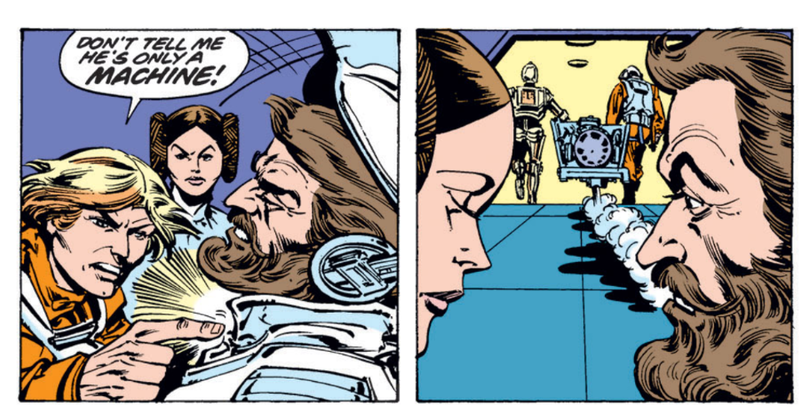 Later, Luke returns to the Rebel base with the gadget and the damaged Artoo. That night, General Dodonna tells Luke and Leia that they've figured out how the device works, but whomever uses it to destroy the base is unlikely to return. Because any other pilots capable to performing the mission are needed to lead younger, greener ones, Dodonna must ask Luke to do it. Piloting a confiscated TIE fighter, Luke flies towards Yavin, activating the device to signal the base, which creates a whirlwind that keeps away all the dangerous gases. Flying through it, Luke discovers that Tagge's base is a massive turbine, which creates the whirlwinds. He quickly launches his charges, destroying the base, but then is lost in the swirling gases of the planet. Using the Force, he is able to find a way out, but unknownst to him Baron Tagge's ship escaped as well, having followed Luke out. But Tagge is nevertheless enraged that Luke ruined his chance to show up Darth Vader, and vows to do worse to Luke than Vader did to him. 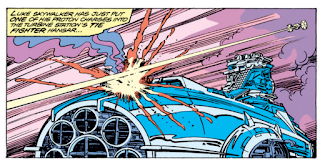 Artoo is damaged in this issue, not unlike the end of A New Hope; his fate is left for the following issue. The letters page in this issue addresses the confusion over General Tagge and Admiral Motti, rightly affirming that Motti is the officer Vader Force choked in A New Hope, not Tagge. Luke insists that a badly damaged Artoo is more than just a machine, and doesn't deserve to be broken down for parts. In the wake of Luke's attack on his base on Yavin, Baron Tagge has developed a personal animosity towards the young Rebel. Once again, faster than light travel is referred to as "warping". The captive TIE fighter Luke flies to destroy Tagge's base is capable of firing proton torpedoes; TIE fighters of this vintage lack that ability. 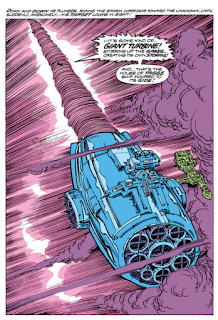 Great splash page of the massive turbine that allows Tagge's fighters to travel safely through Yavin. Thought it ends well, it's a shame the "Siege at Yavin" is over so soon. Between the setting, the antagonist, and the focus on Luke, this definitely reads the most like a direct sequel to the events of the film, and it would have been nice to see that extended longer (if "Han Solo and the Star-Hoppers" or "Luke vs. the cast of Space HMS Pinafore" can sustain four issue or longer arcs, surely this could, too?). But it does go out on a strong note, allowing Luke to defeat Tagge's plan but keeping the villain alive to return in the future (making him only the series second original recurring antagonist, after Valance the Hunter), now with a personal beef against Luke that should only strengthen the Tagge/Vader/Luke antagonism. 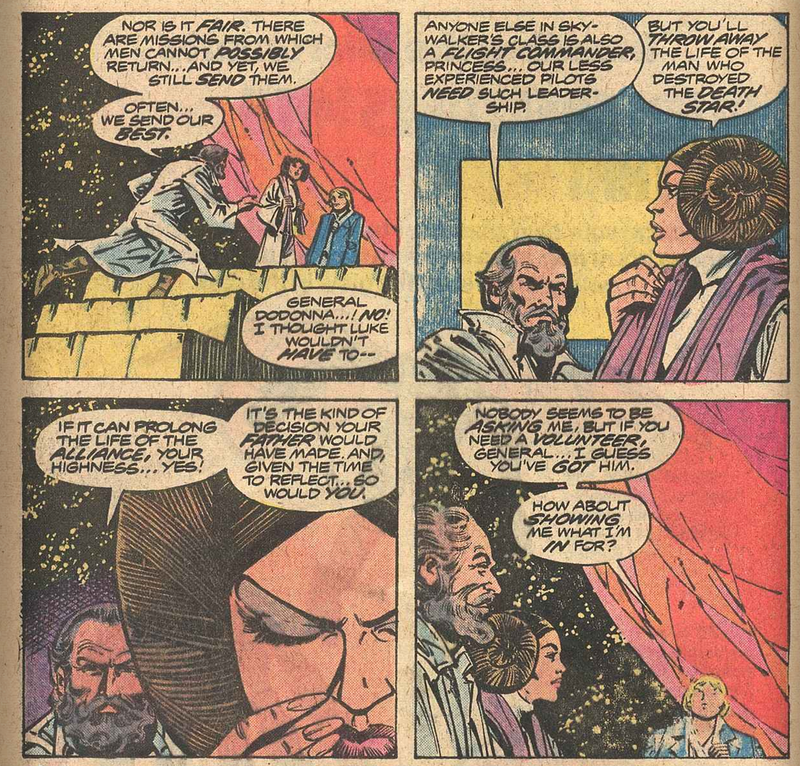 Plus, Luke finds a way to deepen his connection to the Force in a way that makes it feel like the character is actually developing over time, without pushing him so far ahead as to make his training in Empire Strikes Back feel redundant. The fate of Artoo and the return of Valance the Hunter. I was fairly amazed at how much happened in this issue: Luke goes out to get the gizmo from the TIE fighter, returns, ventures to the Imperial base, destroys it, and returns from that — all in 17 pages including the splash you pointed out, while still setting up both immediate (R2-D2’s fate) and longer-term (vengeance of Tagge) plots. Well, Crimson Jack recurred, albeit quickly and after his last appearance not to return again. Yeah; I thought that was nicely done. Yeah, in regards to Crimson Jack, I should have said "the series' second *remaining* original recurring antagonist". 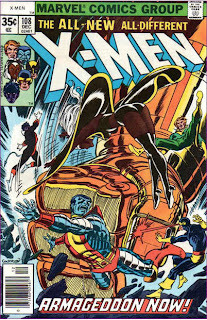 There was an HMS Pinafore story in this comic? Which arc was that? Were there songs? Heh. That's just me being somewhat disparaging of this fellow and the sea pirate storyline of which he was the central antagonist. Also nice to see Luke in a Rebel pilot's uniform, first we've seen of that look for him since the movie adaptation's final issue. Plus there's some good development for him here -- not just the Force stuff, but also the fact that Dodonna says anyone in the Alliance with Luke's experience would hold the rank of flight commander, a coincidental foreshadowing of Rogue Squadron's "Commander Skywalker" as seen in THE EMPIRE STRIKES BACK. 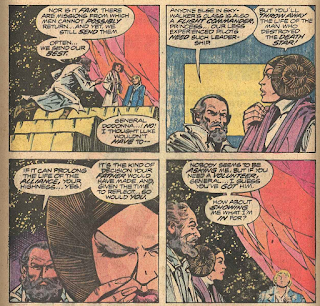 "...it would have been nice to see that extended longer..."
Well, as I noted in my comment on the previous issue, when he revisited this plot concept for the STAR WARS newspaper strip a few years later, Goodwin definitely got some more mileage out of the Empire blockading Yavin -- to the tune of about three years worth of daily strips. * I just Googled Willard to see if I could figure out exactly where he was first named. I didn't locate that info, but I did learn that -- like many of the smaller roles in A NEW HOPE -- his voice was overdubbed in post-production by an American actor. In this case, Willard's voice is none other than Duke from G.I. JOE, Michael Bell! Good point on Willard - I should have mentioned that. And how cool is it that he was voiced by Duke?!? 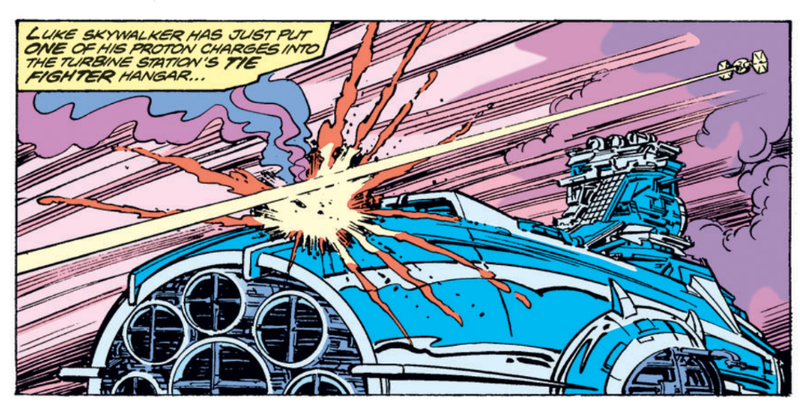 Seconded on Luke being in the X-wing uniform. 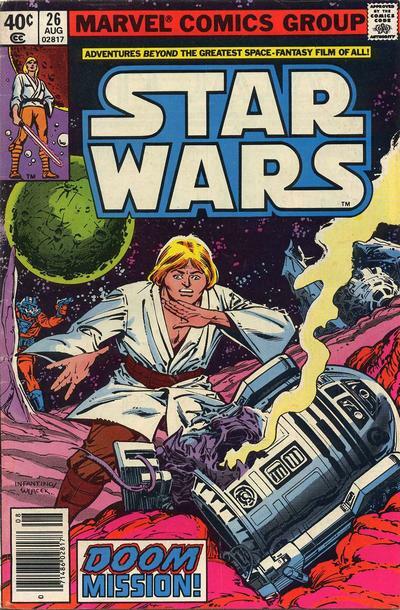 I really, *really* wish Infantino would consistently draw him in something other than his white farmboy tunic.